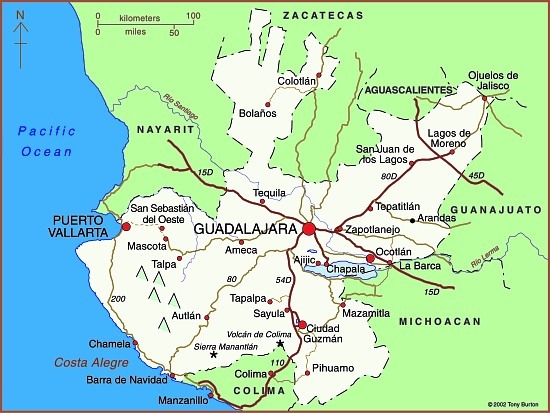 Tapatíos (residents of Guadalajara) and Jaliscienses (residents of Jalisco) often brag that they live in the most “Mexican” area of the country. Are these boasts truthful? This is not an easy question to answer. It involves looking at a broad range of evidence. Jalisco’s climate and natural ecosystems are very diverse like the country as a whole. It is the only state with all of the country’s five principal natural ecosystems (tropical evergreen forest, tropical deciduous and thorn forest, temperate forest, grassland and mesquite-grassland, and arid and semi-arid scrubland) [Geo-Mexico, page 31]. Furthermore, Jalisco has Lake Chapala, the country’s largest natural lake as well as the Colima Volcano, one of the most active in the country. Certainly from a physical geography perspective Jalisco appears the most representative of Mexico as a whole. (For other natural wonders of Jalisco see John Pint’s website: http://ranchopint.com). Jalisco’s socio-economic characteristics are also representative of Mexico. Its population has an average growth rate and is distributed among a very large city, secondary and smaller cities, extensive farming communities and isolated indigenous areas. While its adjusted per person income is just below the national average, its human development index (composed of infant mortality rate, adult literacy, school enrollment ratio, and adjusted average personal income) is slightly above. Jalisco is similar to Mexico regarding the main economic sectors of agriculture, industry and services, including tourism. From a tourism perspective, Jalisco includes everything Mexico has to offer: fantastic beach resorts, urban cultural and artistic attractions, natural wonders, significant indigenous areas and impressive archeological sites. On the other hand, Jalisco is not representative in that it is the leading agricultural state (first in production of corn, beef, pork, poultry, milk and eggs). It is also more predominantly Catholic and politically more conservative than Mexico as a whole. Aside from these two exceptions, Jalisco is quite representative from a socio-economic perspective. Perhaps cultural aspects are the most important in determining the most “Mexican” of the 32 states. Here Jalisco really stands out. It is the birthplace of such stereotypical Mexican cultural characteristics as charrería (Mexican horsemanship), jarabe tapatío (Mexican hat dance), mariachi music, and tequila, the national drink. In conclusion, the available evidence appears to support the boasts of some Tapatíos and Jaliscienses that they live in the “most Mexican” area of the country. Many aspects of Mexico’s culture feature in Geo-Mexico: the geography and dynamics of modern Mexico, a handy reference guide to all aspects of Mexico’s geography. If you have enjoyed this post, consider gifting a copy of Geo-Mexico to someone you know.